Baluchari Silk Sarees are weaved of Bishnupuri pure silk. These sarees are nowadays most wanted attires for the saree lovers as wish to show off unique style. The intricate weaving depiction in border and pallu gives baluchari sarees a rich and ethnic look. Besides that the enchanting pattern of weaving attracts too much the saree lovers. 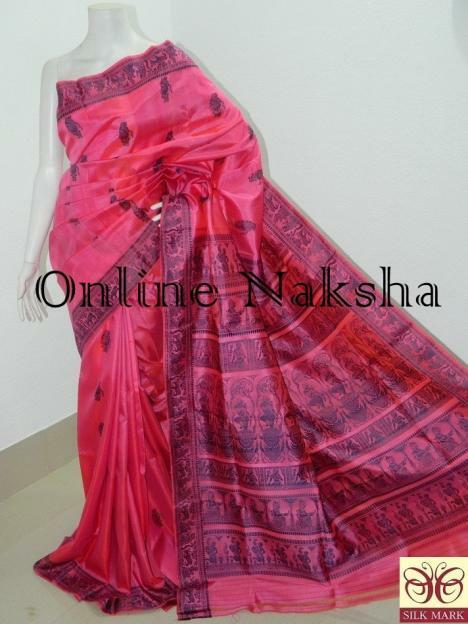 This lovely saree comes with silk mark. Silk mark ensures about the genuinity of the fabric. After all you can choose this saree for your upcoming corporate party, where you wish to show off unique style. Drape it to personalize yourself in the crowd.